Pandini's Italian Restaurant franchise business opportunity. Free Pandini's Italian Restaurant business franchise information. Try the Labretti, Pandini's signature toasted flatbread sandwich or one of the many individual gourmet and traditional pizzas. Fresh salads and Italian classics such as strombolis, calzones and baked or tossed pasta top the New World offerings at Pandini's. 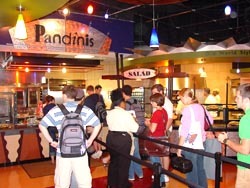 Dine-in or take out, Pandini's has the ability to satisfy appetites from morning 'til night! With flexible build-outs including full-service restaurants and "express" versions, Pandini's is perfect for both single and multi-site development in all 50 states! At Pandini's you work with a certified trainer from start to finish! With one week of hands-on training for each position and two days of classroom instruction focusing on guest service, marketing and financial management, it's easy to see how we make it simple for you to learn the standards and support Pandini's offers. Each Pandini's will receive a minimum of 8-10 promotions per year that include recipes, procedures, POS, banners and miscellaneous merchandising materials. A la carte merchandising options are also available. To learn more about the Pandini's Italian Restaurant franchise opportunity, simply complete the form below.